If you’re planning to become a first time home buyer, there are some things you can do to make sure you have all your ducks in a row. Improve Your Credit Score. The higher your credit score, the lower you can expect your monthly payments to be. Get a credit report from a reliable source and consider getting advise on improving your credit score from a professional. Find Out Your Price Range. A lot of potential home buyers aren’t aware of how much they’ll actually be paying for the home they want. You can use mortgage calculators online to get a better idea of the price range you can afford, before you start looking for a home. Be sure to ask us about our preferred mortgage loan officers! Save. You’ll need to put money down to buy a home. Typically you put down between 3 and 20% of the full cost of the home. Additionally, you will need to pay closing costs. If you’re a first time homebuyer you may be able to find some local assistance with these costs. Once you’re in your new home, you want to make sure you’ll still have some savings, because going forward, you’ll be responsible for all repairs. Get Preapproved. By getting preapproved, you can simplify the process of looking for a home (you already know how much you can purchase) and shave time off closing (less paperwork to shift through). We work with the best lenders in the industry. Click HERE for more information for local lenders. Be Patient, Find the Right House. 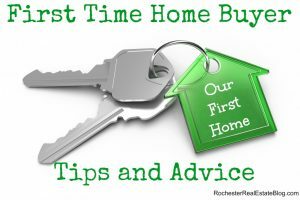 Many first time homebuyers get so excited to buy a home, they go for a quick purchase. But houses can’t be returned. Be patient, and make sure you properly think through your purchase before you make it. Every policy has exclusions, and it’s important to fill in coverage gaps that can affect your unique needs. For example, flood, earthquake and water backup damages aren’t typically covered in a standard policy. If you’re anticipating any of these issues, it may be wise to add additional coverage. You also may want to consider adding extended replacement cost coverage for your dwelling or an umbrella policy for liability coverage. Review your policies every year. Changes to your home and even your neighborhood can raise or lower your premium. If you’ve made an addition to your home, such as a room addition, new bathroom, attached garage or finishing out your basement, you’ll want to increase your policy so that, in the instance of a large property or liability loss, you’re not underinsured. On the other hand, if risks have been reduced, your premium could decrease. Updates to your home, such as a new roof, burglar alarm, fence or pool cover, can reduce risk and potentially lower your premium. Next Post: Is Your New Engagement Ring Properly Covered Under Your Insurance Policy?